Zaroven vsak zacal i new projekt " MNT ZZ9000"
Moc nevim o cem to je, ale pise se tam neco o ARM CPU v Zorro slotu? 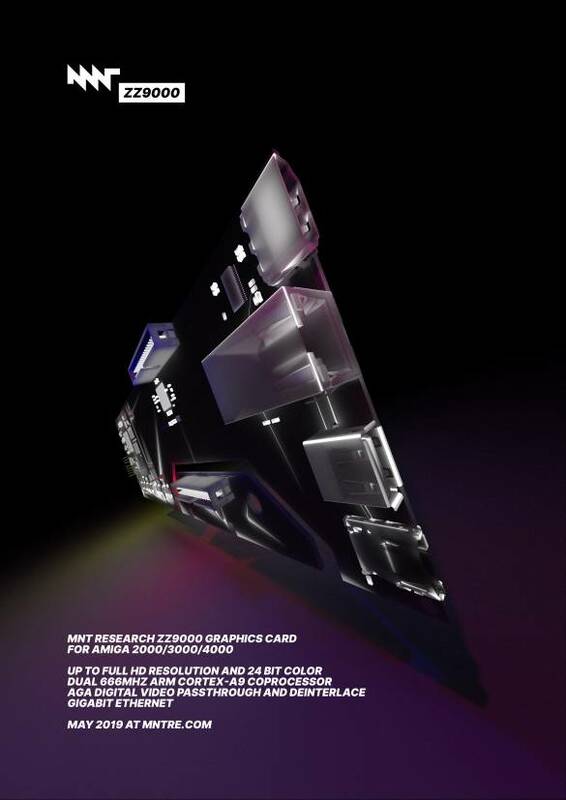 ZZ9000 is the successor to the VA2000 Amiga graphics card. But it can do more than just graphics: based on the Xilinx ZYNQ XC7Z020 chip, it features not only a powerful 7-series FPGA, but also 2 ARM Cortex-A9 cores and DDR3 memory. The card is currently in active development, more updates to follow. Shipping is anticipated for the end of October 2018. Jasne, nic proti - ak bude SW na ten offloading, bude to super. Len v tej cene ma Vampire full CPU + RTG, teda sa to bude imho tazsie marketovat. Ci nieco prehliadam? MNT2000 v rychlosti a ovladačích dost pokulhává, snad to bude tentokrát lepší. Napad je to pekny, ale podpora softwaru bude zasadni (nejenom ARM CPU, ale i zakladni ovladace GFX, LAN etc.). Vampire ma docela pocetnou komunitu uzivatelu, ale aplikace primo pro "68080" prakticky nikdo nedela. Ich habe damit bereits Photoshop, MS Excel und Emagic Logic unter ShapeShifter mit 15 Bit und 1280x1024 getestet. After making the money transfer in december 2016 and signing the software acquisition agreement on January 30th, 2017, we have bought the P96 RTG software from Tobias Abt and Alexander Kneer. A prior license agreement with Hyperion entertainment for use of P96 in OS4.1 is part of the agreement, and will of course be continued under ownership of iComp. There is no other license agreement with any other party besides this. In the following months, we have cleaned up the source code and made small improvements to the software. Over the course of development of OS 3.1.4, further improvements have been made, which we are now offering as a download product. Please log in to your member account to also view download products in the shop. While the authors Tobias Abt and Alexander Kneer have only given access to the API for graphics cards to paying customers after signing a non-disclosure agreement, we are now documenting the API for free for anyone in our Wiki. We'd like to support community projects like the VA2000 graphics card with this, but also take other drivers out of a legal grey zone that resulted from the previous licensing model that Abt and Kneer have chosen. By publishing the hardware manufacturer's API, we are delivering on a promise that we've made even before purchasing this software package. Unfortunately, there is a market actor that claims to have a perpetual license for P96, without having any written proof for this claim. We were even summoned to not advertise what the agreement clearly says: iComp GmbH is the only legal source for a P96 software registration. We believe that a claim of a software product or bundle containing a "registered version" of P96 is false advertising. The legal status of the shareware archive of P96, which has been available on Aminet for years is not changed: It stays legal to distribute this archive free of charge. This download product is the first to use a new pricing model in our shop system: "Pay what you want". As opposed to other fields where this model is used (for example in selected restaurants), we have set a lowest price, as otherwise the administrative cost would be higher than the chosen price. We are hoping for the fairness of Amiga users to register each installation of P96. This is targeting especially the users of emulators, PCI bus boards and new FPGA graphics cards, which would be almost useless without P96. Časové pásmo nastaveno na GMT +2. Aktuální čas: 00:33:52.